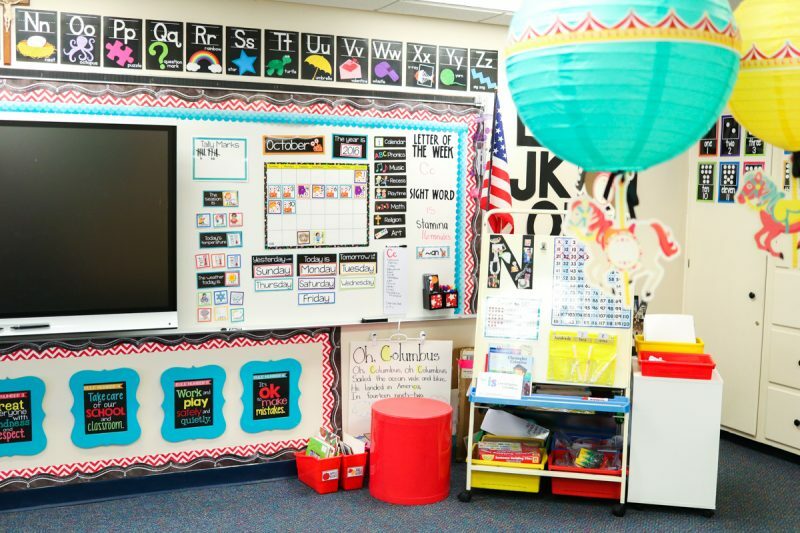 Now that I am finally adjusting to all of my classroom changes this year, I've had a chance to rearrange a few things that just haven't been working for me and fall into a groove that fits our classroom needs. We are already seven weeks into the school year and it seems crazy that my feet are finally landing firm on the ground, but sometimes that's just the way it goes. One change that I have absolutely loved was the placement of my Otto Storage Stool beside the classroom calendar as my teacher chair. It's the perfect seat to tuck into my calendar area, it works great as a flexible seating option, and I adore the benefit of extra storage that it offers. This post contains affiliate links. I receive a small commission when someone makes a purchase through one of my links, which helps to support the blog. Thank you also for GitaDini for sponsoring this post to spread the word about their Otto Storage Stools. All opinions are my own and I only promote products that I absolutely love. For years, I've used a standard chair next to my calendar area. You may recall the pink chair I used in my rainbow chalkboard classroom. When I changed my classroom decor to Vintage Circus, out went the pink and came a black chair. The chairs were great, but the back of the chairs had a tendency to block materials and information on my classroom whiteboard. 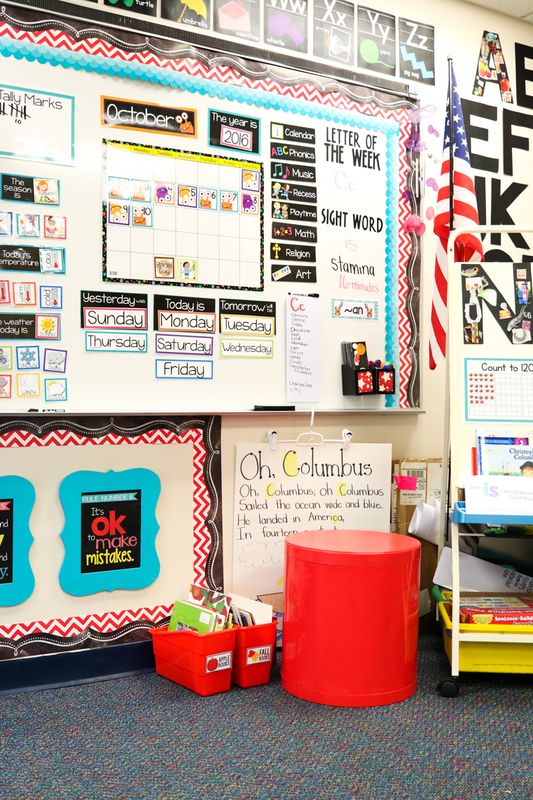 As you know, wall space is precious in a classroom. And now that I have a huge Smartboard dominating my magnetic whiteboard, every inch of space that remains in this corner has become completely precious to me. When my Otto Seating Stool arrived this summer, I knew it would be a perfect fit for my classroom. It's just the right size to tuck into my little calendar corner. The stool itself is made of sturdy polypropylene, and is a great seating option for kids or adults. The price is also fantastic. The stools can be purchased at Target.com for under $30. GitaDini manufacturs Otto Storage Seating in a rainbow of colors, which means that there is a color that's a great fit for any classroom. Click any image to read more about this wonderful teacher chair. 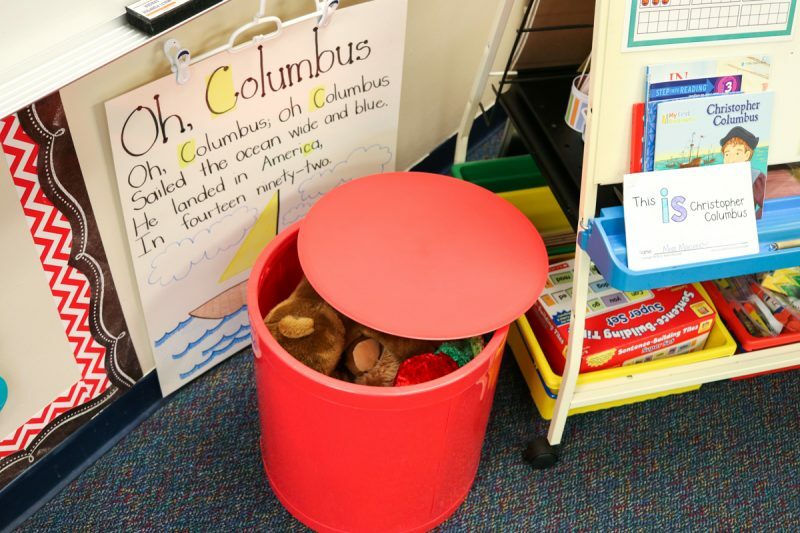 Now let me tell you my very favorite part about these amazing Otto seats: they are a great classroom storage option! The top of the seat lifts off for easy storage access. I keep mine filled with stuffed animals that I have collected from Kohl's over the years. It's nice to have the stuffed animals tucked into a place that's conveniently hidden away. GitaDini also offers an Otto Storage Stool design with oval cutouts so you can easily see the contents of what's inside for the same great price as the solid style. 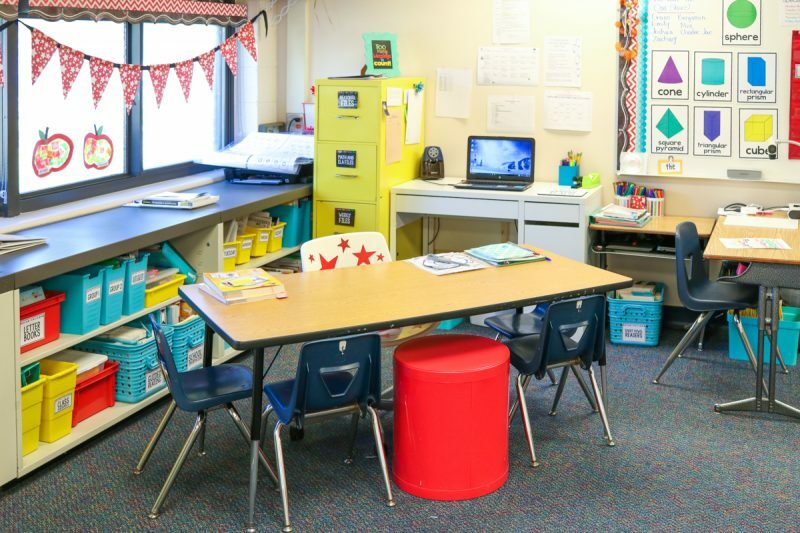 My initial hope for the Otto storage stools was to put five of them around my guided reading/teacher table and replace my traditional student chairs with the stools. I thought they would look so cute in this corner of my classroom. After constructing my first stool, it was apparent that the stool was a little big for the rest of my kindergarten furniture. Five Otto stools would just barely fit around my guided reading table without any additional space to spare. 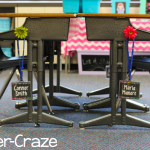 They would be a great table seating option for the older grades (3rd grade and up), but weren't practical to mix in with my kindergarten tables and desks. If you can believe it, this handy little stool actually requires some assembly. I was more than a little surprised when my Otto arrived in a tidy, flat little box and I had no idea how the good folks at GitaDini managed to fit an adult-sized stool into such a small box. I opened the shipment to discover simple assembly instructions. It's not typical assembly project, and it does require a little bit of finesse, but the assembly process should only take 5-10 minutes. Here's a quick look at the assembly process for my classroom Otto. Now that you've seen a little bit about my Otto seat, it's time for you to have a little fun. GitaDini is graciously giving away a pair of Otto Storage Stools to one lucky Kinder Craze reader. You can either keep both seats for yourself, or share the prize with a teacher friend! Use the Rafflecopter below for your chance to WIN. Thanks so much to GitaDini for sharing the fun. 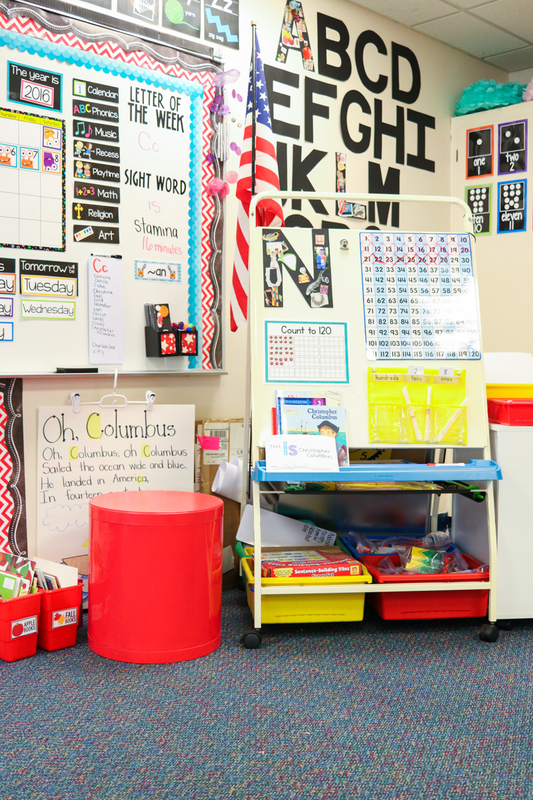 I can't wait to see how you use the Otto Storage Stool in your classroom! What are the dimensions of the stool? How tall is it? I hope you don’t mind me answering your question instead of Maria 🙂 The stools are 17″ high and 16″ in diameter. I hope this helps. I dint mind one bit! Thank you Christina! I love the Otto Chair idea! Hope I win. I wondered where did you get the large alphabet letters? It looks like you use them to find things that begin with that letter? Please share. Thank you! I can’t find any weight limits for the Otto on Target’s website or on the the GitaDini website. 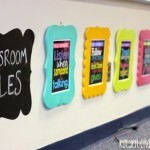 I love these, but want to make sure that the adults in my room can safely sit on them. Do you have any idea what the weight limit may be? Dear Jenna, this is Christina from Otto Storage. You are so right, we need to add the weight limits, so sorry they are missing on the website and Target online. Here they are: Otto meets seating guidelines and can handle weights up to 300 lbs vertical. It is not recommended and advisable to sit and tilt. I hope this helps. These stools would fit perfectly in my classroom~! Hi there! 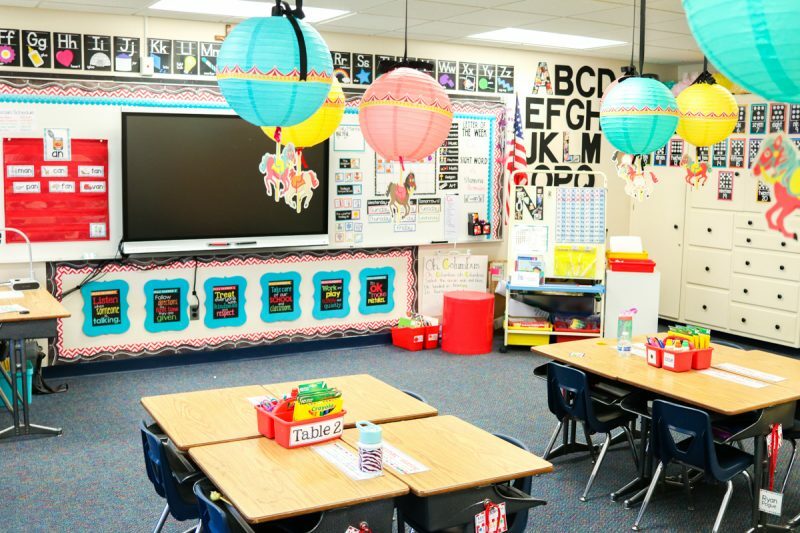 Your classrooms every year are an inspiration to me! 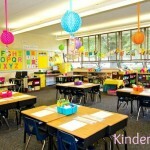 I am teaching kinder this coming school year for the first time and am thrilled! I have a airsickness question. I am trying to purchase a rectangular guided reading table and am torn between getting the 24×48 size versus the 30×72. What size is yours because it looks like what I need? Thanks in advance! I don’t know the exact measurements, but it is definitely closer to 30×72″ than 24×48″. I hope that helps a little! Hi there! 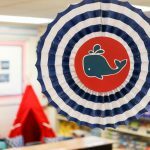 I can’t seem to find your post on the vinyl kid cut outs and I’d LOVE to do them in my class next year! Moving from a 3/4 back to kinder!! Thank you!! You have a beautiful classroom!! 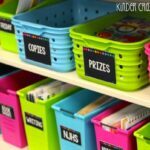 You can read more about how I created my classroom silhouettes in this blog post: https://kindercraze.com/silhouettes-file-cabinets-and-bright/. I’m so excited for your move back down to kindergarten!